The Toilet Lid Sink pictured above is a new discovery for me, even though it has apparently been around for years in other parts of the world. It has tickled my interest a tad bit: I am more interested in the water-saver aspect than on the space-saver aspect. However, I dread washing my hands, let alone brushing my teeth, in ice cold water all the time. 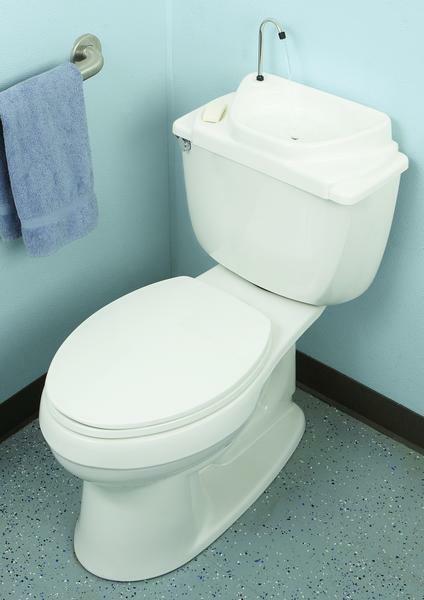 Plus, leaning over the toilet to use the sink could become cumbersome. So, I guess I would consider it as an additional sink, useful more in summertime than in winter, rather than think of it a replacement sink. And, I can see myself at least washing my hands after using the toilet, winter or summer, perhaps a few times a day, thereby saving some water. We have been gradually making our house energy-efficient: upgraded dishwasher, washer/dryer, water-heater, oven, more out of necessity since they started giving up one by one. If we can afford to get our windows upgraded, we'd save so much on heating/cooling. As soon as we moved in though, D put in spanking cool 1.5 gallon tanks, replacing the old 3.5 gallon behemoths in 2 of the 3 bathrooms (well, more like 1, ½ and ½ bathrooms, actually). All by himself. One fine afternoon, I returned home with my wee tot after a round of shopping for supplies and found the new toilets ready to use! We both agreed we need to cut back on our food indulgences. Not that we don't eat healthy, we just don't exercise enough. Winter is a terrible demotivator for us. And then, somehow, the talk turned to Community Flushing! We were both gung-ho about conserving water, being environmentally (and water-bill) conscious and what-not. As our philosophies agreed, time came for us to chalk down the plan of action for implementing the community flushing in our home. "We should totally do it, as long as I get to go first, and you get to flush."